First of all, you know this is going to be good; it’s hot fudge sauce. What you may not know, though, is just how good this particular hot fudge sauce is. It is, in fact, the best hot fudge sauce ever of all time Amen pass the beer nuts. This hot fudge sauce is not just the ne plus ultra of hot fudge sauces, it is a thing of power. Let me tell you a story. My relationship with my stepmom did not begin smoothly because I was, to put it succinctly, a surly twerp. There was no twerpitude from Val, who assured me kindly that she did not intend to try to take the place of my mother. It was all me people. I had that arena sewn right up. Val never tried to talk me out of anything. Each time I visited, she smiled, talked books and movies, and fed me. Val turned out amazing food every time I was anywhere near her and it was not long before I removed my foot from my mouth to make room for dinner, and uncrossed my arms so I could hold a fork. Then one day, Val served me a bowl of ice cream with a generous amount of this hot fudge sauce on it and I was smitten with both the sauce and Val. I am fortunate enough to know now that my stepmom was one of my best friends AND I have her glorious hot fudge sauce. 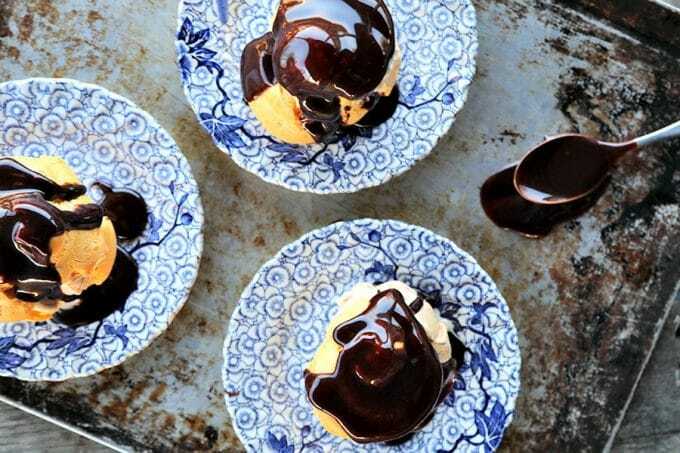 There isn’t enough time in the world for me to tell you all the things that made Val so wonderful, but I can spell out what makes this hot fudge sauce so special. This is the best kind of hot fudge sauce. It drizzles onto your sundae and then partially firms up to a stretchy, chewy, caramel-like hot fudgy chocolate crown. Tell me you don’t want to eat that right now. It takes 10 minutes to make and 8 of those minutes you are not to stir anything under penalty of sad sauce. The ingredients are not at all exotic: unsweetened chocolate, butter, sugar, light corn syrup, a pinch of salt and vanilla extract. Hey ho, hot fudge! A spoonful of this, straight from the jar in the refrigerator, is enough to turn a bad day good very, very quickly. I’ll direct your attention to the ingredient list. See? You’re smiling already! This recipe comes from a woman who was arguably one of the most patient, loving, lovely, brilliant, forbearing, forgiving, well-read, witty, insightful people I’ve ever met. You can’t argue with hot fudge that comes from someone like that. Please don’t be tempted to use sweetened chocolate in this recipe. You will bitterly regret it. The chocolate will melt most evenly and quickly if you chop it or break it up before adding to the pan with the butter. The more finely you chop the chocolate, the faster it will melt. It’s best not to use a power burner (if your stove top has one) for this process. They throw a great deal more heat than a regular burner. You can’t walk away from the pan while the chocolate and butter are melting. Because you’re melting it over low direct heat, chocolate can scorch. If you’re concerned about this, you can take out a little insurance policy by melting the butter gently before adding the chocolate to it. It is in the recipe, but it bears repeating. Do NOT stir the mixture once it comes to a boil. If you do, you’ll have crystals of candied hot fudge in your sauce and that is not the goal here. The goal is silky,shiny, and smooth. No matter how much you want to, I don’t advise licking the spoon until it has thoroughly cooled. I may have learned this one the hard way years ago. Ahem. 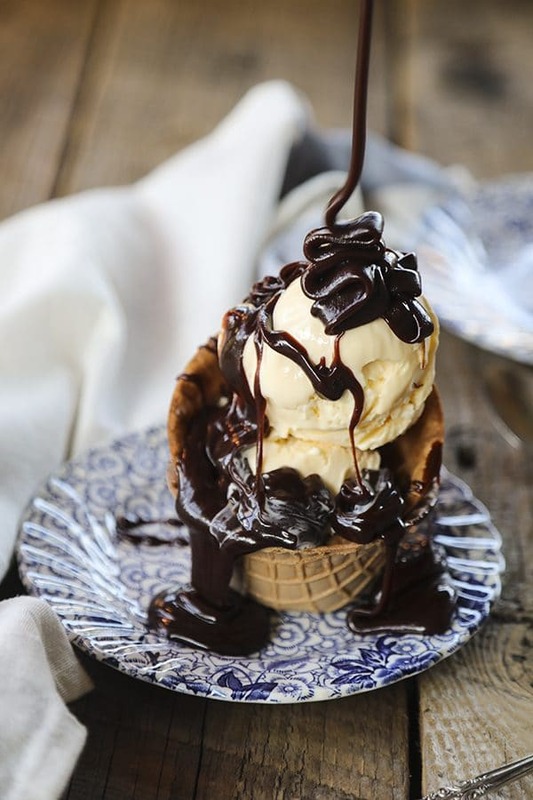 Grandma Val's Hot Fudge Sauce is seriously fudgy hot fudge sauce that firms up ever so slightly when poured over ice cream to form caramel-like ribbons of chocolatey goodness. Oh yes. It does. Adapted gently from The Houghton College Community Cookbook submitted by Janet Spegen. Melt the butter and unsweetened chocolate together in a large, heavy-bottomed saucepan over low heat, stirring occasionally. Stir the corn syrup and boiling water together in a heat-proof measuring cup then add to the pan with the sugar. Increase heat to medium and stir mixture until it reaches boiling. Boil without stirring for 8 minutes. Really. Do not stir that stuff. Remove from heat and stir in the vanilla extract and salt. It will bubble up violently, so be careful. Let rest for 5 minutes before pouring into a heat-proof container with a tight fitting lid. (A canning jar works perfectly for this situation.) Be certain the container you use is small enough to fit into the microwave for reheating purposes. Remove lid from the jar and microwave for about 30 seconds. Heat in additional 10 second bursts until the hot fudge flows freely when poured. This post was originally published July 7, 2011. Updated photos and Cook’s Notes in June 2018. Want some right now!!! Meanie! Ok, you know I’m a chocoholic….you post this recipe. Bless you. Bless you. Bless you. I cannot wait to make it. We have an ice cream sundae bar for all our birthday parties. I think this will be part of that tradition now! Thanks Val! Oh goodness. I want to bathe in it. The same thing happened to me. I’m going to turn this batch into a rolled candy. Gerilynne and Lisa- I’ll pass your thanks along to Val! Amy, Saint Tigerlily, and Lindsay- I hear ya. Mindy- You’re so very welcome. I hope this is exactly what you’ve been trying to find! Nicompoopitude. Heee. What a great post. I think a slightly chewy caramel would be good – since I messed mine up though it’s closer to ‘need a knife to get a piece off’ caramel. Next time I’ll shop ahead of time and do better at following directions. My spoon and mouth will love this plain anyway! 🙂 I was just so eager to make it since it looked so good that I didn’t want to wait until I went shopping, so yeah, it must be all your fault for posting such an amazing looking and sounding recipe! And it is really good, even too hard, so I can’t imagine how good it will be when I finally do it right. Thanks again!! Can you roll it into a rope and cut pieces off like candy? Super yummy homemade Tootsie Rolls. I’m going to put a cookie sheet in the fridge just till it gets cool , invert it and pour small amounts of sauce at a time over it and try to quickly roll it into a rope. Then I’ll quickly cut , let harden in the fridge and wrap in parchment paper. Hope it works. Why is it that every time I swear off sugar and promise myself that I will eat very well for the foreseeable future a recipe like this comes along. Life is either just playing with me or its telling me to just give up and eat what I want. Either way, this one is getting filed away until I cave into my sugar cravings (not too long from now). Sweet recipe & story!!! I love happy endings! I can’t wait to try this! Got over here from Ree’s site – and I’ll definitely be back. Can’t wait to try your Val’s sauce. I had to chuckle about your post because it was so familiar to me. My stepdaughter and I are great friends now and I share my recipes with her regularly. Plus I’ll be a Grandma Val in Feb.! Looking forward to enjoying your blog. Looks wonderful, except that MY NAME IS GRANDMA VAL!!! I thought I was the only one! It’s what my 6 little grands call me, per my request! 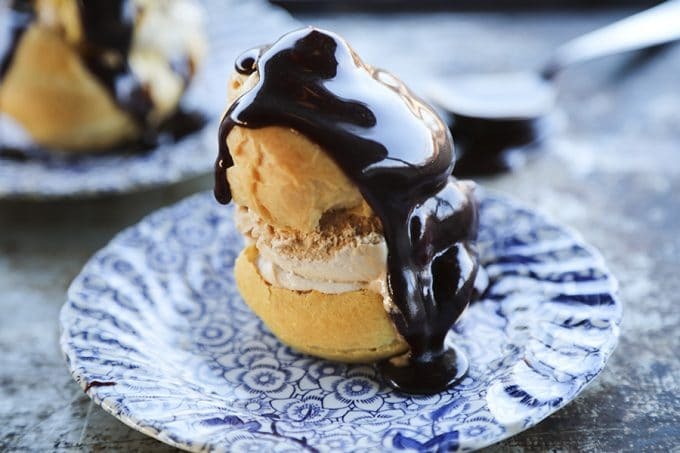 I just found this yumcious recipe,exactly what I was looking for to adorn my Christmas Profiteroles pile. I store my favourite recipes on my own blog for my own use, and credit where I have got them from. The blog is primarily for my use, but as it is on the web who knows who else will come across it. I want to ask permission to add this recipe to my list, but don’t see a way of asking other than by commenting here. Please and thank you if you say yes! Haven’t given any stars yet as I haven’t tred it , but it looks deliciously promising. This is great hot fudge but I too messed up somehow. It’s a little to hard once it hits the ice cream ……. Great anyway! I have gone online to learn how to correct it, but there is contradictory info out there. Some say add water. Other say NO,NO to the water -add oil or Crisco. When I want to heat this I have to cut off a piece to warm it. I’ll suffer through but would love to know what I did wrong and how to correct this batch. OHHHHHHHH, I just made a double-batch. The chewiness is AWESOME!!!!!!!!! Thank you Rebecca!! I have made this and love it. But I will issue a warning. This recipe does not reduce. If you try to cut it in half, or in my case try to make only 2/3 of the recipe you will wind up with a soft chocolate caramel. They were good, but not for sauce. I reheated it in the microwave, poured it in a pan and cut it up for candy. It was good, but so is the sauce when you make the full recipe. i plan on making this with my granddaughter. How much does it make/? Can you double the receipe or is it better to make 2 batches? I want her to be able to take some home. I’m sure it’s not an easy road being a Stepmom. Val sounds like a lovely person. 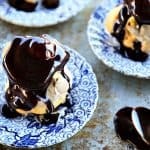 The hot fudge sauce sounds right up my alley…will need to try it soon! Hi Tanya- If you love salted butter, I say go for it. Yes, of course. It will add a touch of salt to the recipe, though. This is a delicious sauce. However, when I put it over ice cream it became a hard chocolate candy. I m even considering making it into a rolled candy. Did I do something wrong or is that how it was meant to be. It made it difficult to eat. Hi Kenna- It sounds like perhaps it boiled a bit too long or perhaps you had a seriously powerful power burner under it. You can thin it out a bit if you’d like, by gently warming it and whisking in boiling water a tablespoon at a time until it’s pourable. No— boiled it eight minutes on just enough heat to keep it at a boil. It pour ok onto the ice cream, then became TAFFY. FLAVOR IS FABULOUS. I cut the recipe in half and something did not work. It was the consistency of Caramell and definitely not pourable. Hi Judy- Is that super thick consistency after it cooled or before? If it is before, just gently heat it and whisk in boiling water, one tablespoon at a time, until it reaches the consistency of thicker chocolate syrup. If it that super thick consistency is post cooling, you need to warm it up to pour it!